Well good infrastructure are available with a centralized AC library; sports committee hall, no free Wi-Fi available in the campus just enjoy with our own data sport meet will held yearly once in the month of December. Labs are maintained well and still need required some changes. The campus crowd is around 5000 students present on my campus. There is a good climatic condition in the surroundings. No, Our college have everything that a student should need. No any bad remarks about my college. University has quite a good infrastructure but management is not to that level beautification of university is a necessity. Management regarding other issues is between ok and good. 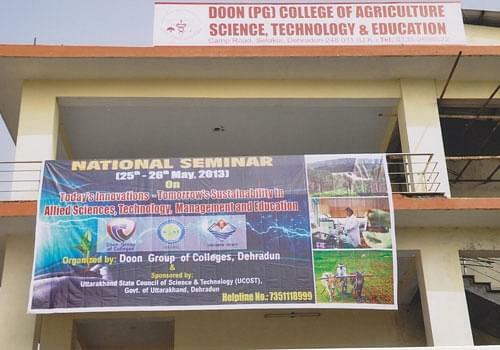 Established in the year 2001, The Doon Post Graduate College of Agriculture Science and Technology, Dehradun,Uttarakhand is an important part of the Doon Group of Collage. Being a part, the college is managed by the Doon public educational society. Since its inception, the college is being managed under Chaudhary Charan Singh Memorial Educational Society as well as Maharani Lakshmi Bai Memorial Educational Society, two educational societies. The purpose of the institute is to teach the students with a focus on research while generating human resource that is able to meet the growing demands of the society in the present fast changing world. In order to groom students, the college has made the provision of ultra modern classrooms, facility of hostels, well-equipped laboratories, well-stocked libraries, hygienic canteen and even a fully functional placement cell. 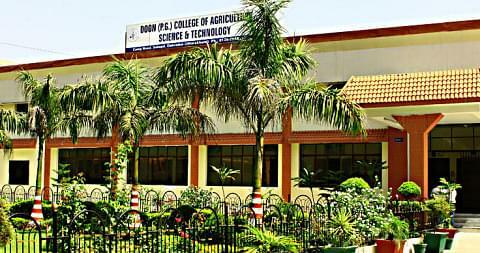 Why to join Doon Post Graduate College of Agriculture Science and Technology, Dehradun, Uttarakhand? 1. Inspiration to students –The college makes sure that workshops, conferences, social programs and several seminars are organized on a regular basis. These programs tackle the issue of various problems of the society in support of the organizations that have a good academic repute. The purpose is to inspire students through interaction with intellectuals gathered at the meet. 2. Scope of Active Participation –The college makes provision of guest lecture addressed by faculty from premium institutes like IITs and other universities. The vice chancellors of colleges are also invited for the same to give an edge to the students, who participate in class seminars, discussions, debates too. 3. Requisite Infrastructure on campus –With contemporary and expansive infrastructure for organizing sports, games and other co-curricular activities, the college even celebrates annual day function. Students are motivated to participate in the activities including sports meet, blood donation camps, and others. Is there any seat for msc admission ? Hi Sharandeep, Please contact to this number:- 0135-2629375,2720894 for getting the MSc Course Seats information.